2014-05-21 15:40:32 markiewb Old version of binary has verification and version is still verifable - removing it now. User will have to apply again. 2014-05-21 15:40:27 markiewb Old version of binary has verification and version is still verifable - removing it now. User will have to apply again. 2014-05-20 15:06:30 markiewb Old version of binary has verification and version is still verifable - removing it now. User will have to apply again. 2014-05-20 15:05:35 markiewb Old version of binary has verification and version is still verifable - removing it now. User will have to apply again. 2014-03-15 09:04:22 markiewb Old version of binary has verification and version is still verifable - removing it now. User will have to apply again. 2014-03-15 09:04:13 markiewb Old version of binary has verification and version is still verifable - removing it now. User will have to apply again. 2013-12-12 15:39:11 markiewb Old version of binary has verification and version is still verifable - removing it now. User will have to apply again. 2013-12-12 15:39:05 markiewb Old version of binary has verification and version is still verifable - removing it now. User will have to apply again. 2013-10-28 15:18:48 markiewb Old version of binary has verification and version is still verifable - removing it now. User will have to apply again. 2013-10-28 15:18:22 markiewb Old version of binary has verification and version is still verifable - removing it now. User will have to apply again. 2013-10-24 16:52:20 markiewb Old version of binary has verification and version is still verifable - removing it now. User will have to apply again. 2013-10-24 16:49:04 markiewb Old version of binary has verification and version is still verifable - removing it now. User will have to apply again. 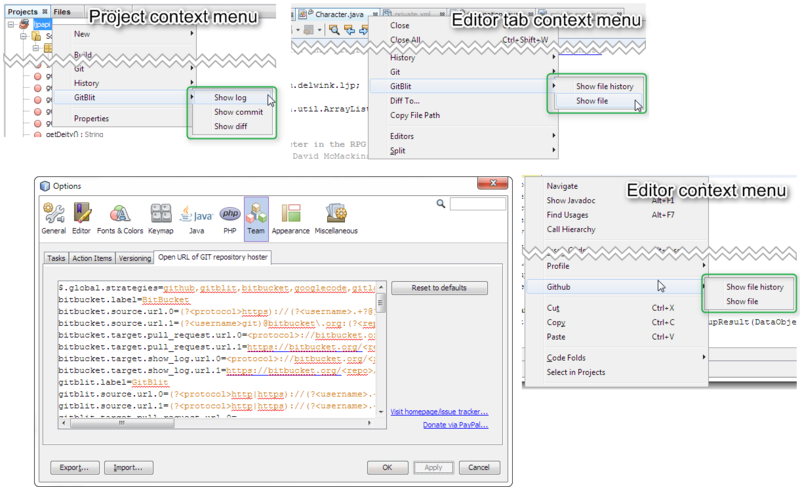 This plugins adds git-related actions to the context menu of a GIT-versioned project OR of the tab context menu. Internally it parses the GIT URL of the project, generates specific URLs for the GIT repository hoster and opens the URL in the browser. The browser is configurable at Tools|Options|General|Web Browser. You can configure shortcuts for each action at Tools|Options|Keymap. Filter for the actions with the name "* (in browser)" in the category "Git".